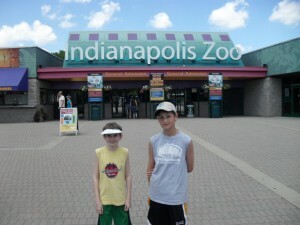 Wednesday was Day 3 of our adventure and we checked out of the motel and headed to the Indianapolis Zoo. We tried (to no avail) to get there early since the forecast was for a lot of sun and 86. As it turned out, thanks to a nice breeze, a lot of shady areas and lots of stuff to see indoors, it really didn’t matter. Among the zoo highlights were the seals and sea lions (video below), a dolphin show, an underwater dolphin viewing area, shark petting, penguins, a walrus, a polar bear and a couple rides on a small roller coaster. We’ve got a lot of video from the zoo and I’ll be working on getting some of it on YouTube. My connection at the hotel doesn’t seem to allow for quick uploading, so I’ll have to wait til I get home to do most of it. We left the zoo around 2:30 to head out for Kentucky and Mammoth Cave. Other than a slight delay in Louisville, the trip went very smoothly and we arrived just before 6:00… or so we thought. Turns out this part of KY is on Central Time, so it was actually only 5. It was nice to pick up the extra hour, though since we’re headed back to Indy on Friday, we’ll lose it again. The highlight of Wed for me was the Hampton Inn we’re staying at in Horse Cave, KY. It was a big time upgrade from our Days Inn in Indy and I got a normal night sleep for the first time in about 3 months. Yeah! Today (Thursday) was Mammoth Cave day, but I’m afraid once again you’ll have to wait until tomorrow to hear about that. It’s time for me to get this posted and see about getting another good night of sleep. 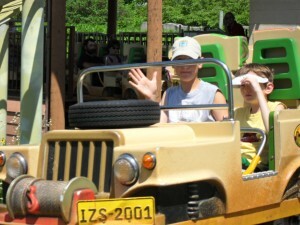 This entry was posted on Thursday, June 17th, 2010 at 10:08 pm	and is filed under Comments. You can follow any responses to this entry through the RSS 2.0 feed. You can leave a response, or trackback from your own site.